For nineteen years, Greater Manchester laid claim to the most bizarre motorway in the British Isles. 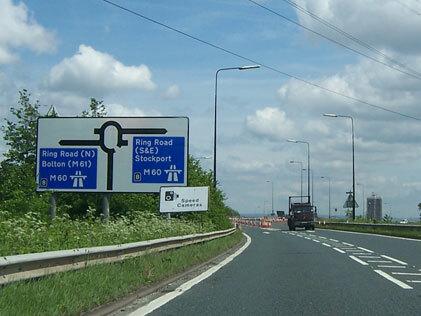 The A6144(M) was just over a mile in length and connected M60 junction 8 with the A6144, allowing goods traffic to access the large chemical plants near Carrington without having to travel through Sale. Aside from its absurd number and diminutive size, the motorway's principal claim to fame was that it was entirely single-carriageway. In May 2006 the road was downgraded to allow Trafford Metropolitan Borough Council easier access for maintenance. Among road enthusiasts (and especially SABRE members), this was seen as a tragedy — the most interesting anomaly on the road network gone! It was also one less rare chance to legally travel at 70mph on a single-carriageway road. With the help of SABRE member "Squadgy" I mounted a rescue mission, planning to grab the sign from whoever came to take it down. No such luck: it took until about 10pm for the road to be closed and the rest of the workforce wouldn't arrive until much later. We left empty handed. In the morning though, he sent an excited message saying that the sign had been taken down overnight - so I returned with another accomplice and got permission to rescue some of the signs that had been removed. Wednesday 24th May 2006, 9pm. The road will be closed overnight any minute now, and when it reopens will no longer be a motorway. Our first worry — what will become of that famous blue start-of-restrictions sign? Thursday 25th May 2006, 12pm. 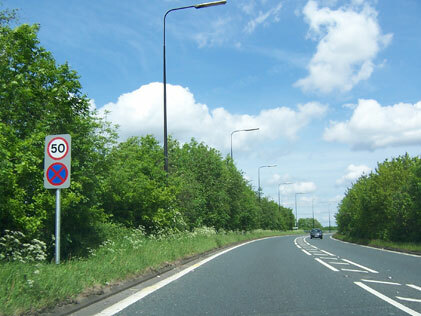 The roadworks and motorway sign have both gone, and a new 50mph limit is now in force. 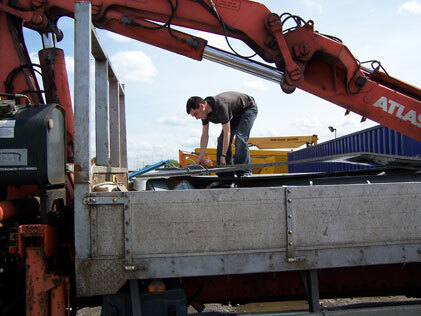 A second rescue mission — this time ably assisted by SABRE member PeterA5145 — took us to the M60 widening works depot at M60 junction 7. To get there, we took a drive down the non-motorway back to the M60. It's still festooned with two-way-road warning signs, and is effectively the same road it was before, but now has 50mph repeaters and clearway signs. Once a motorway, now a non-primary route, the black-and-white sign at the end says it all. At the depot, we speak to the head of traffic management who puts us in touch with their signage sub-contractor. We call, wait a while, call back, all the time expecting to have to pay for the sign. It's even possible by this time that it has been scrapped or stripped down to be re-faced. To our surprise, the contractor's response is to direct us to where his works van is parked at the depot and to help ourselves! The contractor's van, which is knee-deep in heavy aluminium signs laid on top of each other. The biggest are generally on top, including two enormous "River Mersey" signs that manage to cover the rest. The sign we're looking for is right at the bottom and was only eventually extracted with the help of one of the workers on site. 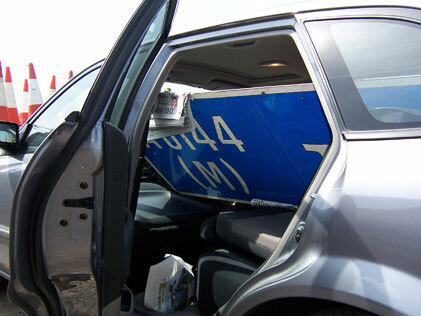 We take a couple of other souvenirs and load up Peter's car. Good job the A6144(M) was only a small motorway — anything bigger wouldn't have fit! Back home, and a bucket of soapy water later, the museum pieces on display. I am very happy (pictured). 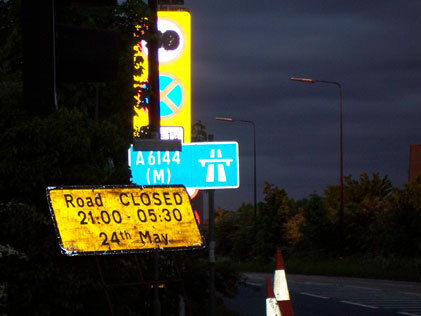 The smaller blue sign was positioned in one of the A6144(M)'s two lay-bys as a reminder not to park there. The four items safely stored indoors and looking larger than life. Closer inspection of the back of the start-of-restrictions signs reveal that it was manufactured in 1987 and is therefore original to the road: the only A6144(M) sign ever. Mission accomplished! 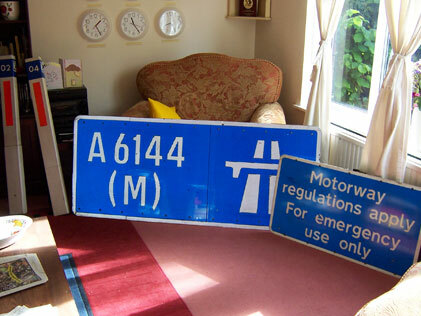 The A6144(M) sign — and probably the others — are now in retirement, but occasionally tour SABRE Awaydays and other events to regale road enthusiasts with tales of their life on the road. 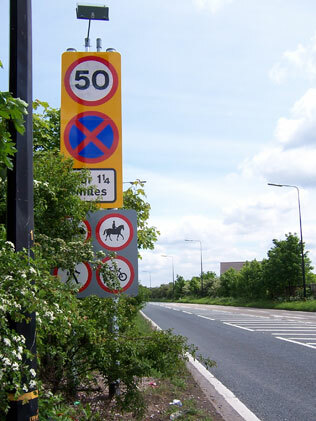 The road signs shown on this page were obtained legally, with full permission of the highway authorities and their contractors. 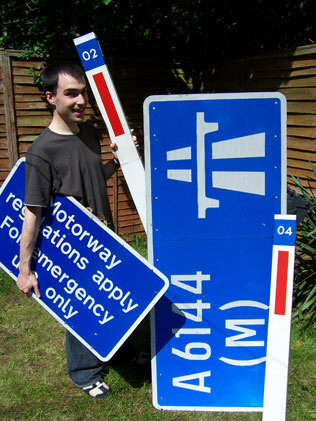 Roads.org.uk does not endorse the theft of road signs. Many thanks to Ste (Squadgy) and Peter Edwardson (PeterA5145) for their help in rescuing the signs — without them it wouldn't have been possible.